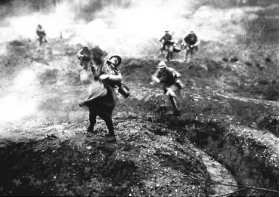 On February 21st in 1916, the German army sets off his major offensive against Verdun. This date marks the beginning of a nightmare. The “hell of Verdun” (l’Enfer de Verdun) will last 10 months; 300 days and 300 nights of ceaseless and murderous battles. The concentration of so much fighting in such a small area devastated the land, resulting in miserable conditions for troops on both sides. Rain combined with the constant tearing up of the ground turned the clay of the area to a wasteland of mud full of human remains. Shell craters became filled with a liquid ooze, becoming so slippery that troops who fell into them or took cover in them could drown. Forests were reduced to tangled piles of wood by constant artillery-fire and eventually obliterated. The effect on soldiers in the battle was devastating, many broke down with shell-shock and some French troops attempted to desert to Spain, those who were caught being shot. On 20 March French deserters disclosed details of the French defences to the Germans, who were able to surround 2,000 men and force them to surrender. 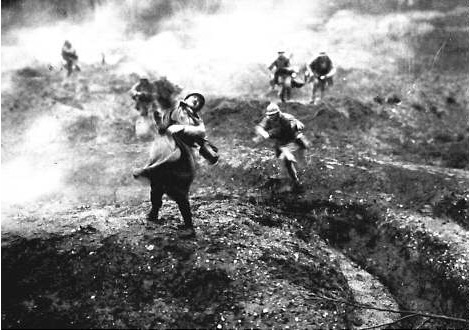 Many troops at the battle never saw an enemy soldier, experiencing nothing but artillery shells and many troops on both sides called Verdun "Hell". "Humanity is mad. It must be mad to do what it is doing. What a massacre! What scenes of horror and carnage! I cannot find words to translate my impressions. Hell cannot be so terrible. Men are mad!" 300 days of continuous fighting, 60 million shells fell on a small area of only 20 km2, more than 300 000 deaths, French and German, nearly 400,000 wounded ... These figures show the intensity of the Battle of Verdun. Trenches, communication trenches and shell holes are still visible. Many military cemeteries and ruins also remember those tragic memories. Nine villages around Verdun will be completely destroyed and never rebuilt: Beaumont, Bezonvaux, Cumières, Douaumont, Fleury, Haumont, Louvemont, Ornes, Vaux.